Today, quality control and the desire for absolute safety have contributed to the introduction of numerous sensors in our lives. Optical technologies have played an increasingly important role in this development because they combine the advantages of a small design, reduced production costs, fast measurement speeds, high precision, reliability, and non-contact measurements across large distances. All fires have certain characteristics (e.g., smoke, heat, or optical radiation of different intensity). 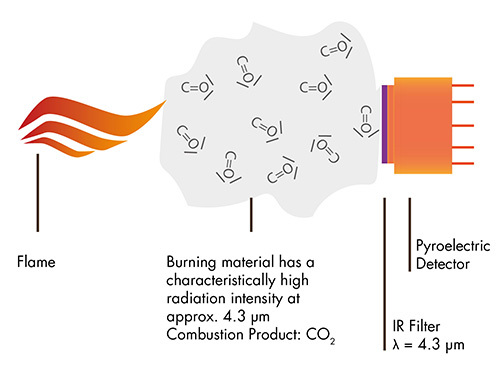 When organic material burns, it has a characteristically high radiation intensity at approximately 4.3 µm. The radiation source is the hot CO2 product of combustion. IR radiation has the advantage (unlike, e.g., UV radiation) that it can be easily detected through fog and smoke. Infrared-based flame detectors have, therefore, become well established on the market. They even have a binding system of classification (e.g., pursuant to DIN EN 54-10, depending on their range). Pyroelectric detectors, thermopiles, and PbSe semiconductors are widely used. For manufacturers, adaptation of detectors for a concrete application, on the one hand, and the avoidance of false alarms, on the other hand, is an art. Spark detectors and detectors used to locate hot spots are similar, yet different in the details. IR detectors are constantly being further developed. Locating flames exactly has recently been made possible through the use of pyroelectric detectors with the help of a 3 x 3 grid matrix (see figure). The distribution of intensity allows the spatial direction to be calculated. If two of these pyros are used, flames can also be detected spatially resolved, making it possible to determine their position in 3D. Being able to locate flames has major advantages. The extinguishing agent can be brought to the location of the fire more quickly. In addition, targeted extinguishment requires less extinguishing agent, which, in turn, results in less damage caused during extinguishment.